Satellite virus: The virus needs a helper virus for viral replication. 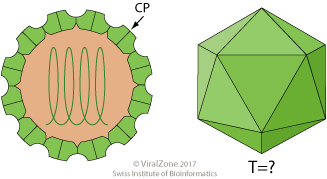 Infection requires host cell to be co-infected with a virus from the genus Alphanecrovirus or Betanecrovirus, family Tombusviridae. ETYMOLOGY Albetovirus: referring to being satellite of alphanecrovirus or betanecrovirus of the family tombusviridae.